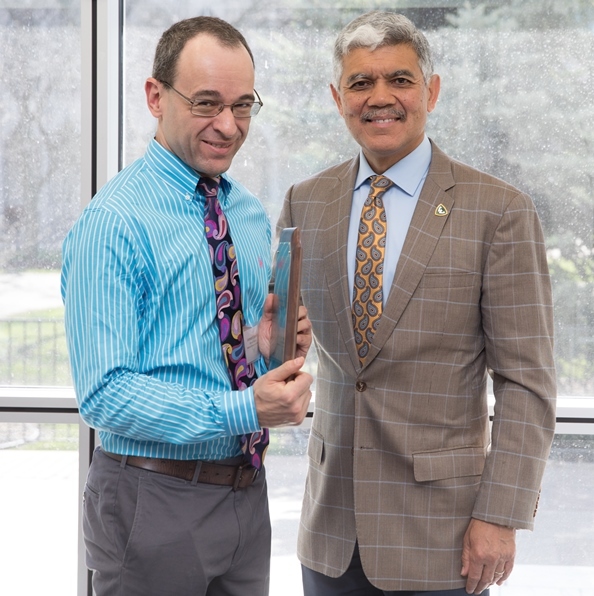 Leonard Lipovich, Ph.D., an associate professor for the Wayne State University School of Medicine, has been named a 2018-2019 Charles H. Gershenson Distinguished Faculty Fellow, an honor established by the university's Board of Governors to recognize and provide support for faculty whose continuing achievements and activities in scholarship, research or the fine and performing arts are nationally distinguished. Dr. Lipovich is a faculty member of the Center for Molecular Medicine and Genetics and the Department of Neurology. He received the award during WSU President M. Roy Wilson's Academic Recognition Ceremony, held April 26 at the McGregor Memorial Conference Center. "I feel heartened and honored to receive the prestigious Charles H. Gershenson Distinguished Faculty Fellowship from Wayne State University. I am grateful to the university for recognizing the impact of my ideas, and for this gracious gesture of expressing support for my work on long non-coding RNA in human disease," Dr. Lipovich said. He is also grateful to the National Institutes of Health for supporting his work, which the Gershenson fellowship recognizes, through the NIH Director's New Innovator Award he received in 2014, as well as a sub-award from the CHARGE Consortium. "My research resides at the interface of two very exciting topics. One is long non-protein-coding RNA (lncRNA), the most abundant type of RNA molecule in mammalian cells, which was long thought of as junk but is now increasingly understood to be essential to normal cellular processes as well as to numerous human diseases. The other is human evolution: Do we have primate-specific genes -- genes that are absent in mice, rats, non-primate animal models -- and can these genes cause human disease despite being still very new in evolution?" he asked. Most lncRNA genes, unlike conventional highly conserved protein-coding genes, are primate-specific in humans. The Lipovich lab was among the first groups in the world to show this. "Our results show that primate-specific lncRNAs can cause cell proliferation in breast cancer, as well as regulate glucose storage in the liver in type 2 diabetes. These lncRNAs may represent a promising new class of drug targets," he added. His group's most notable recent finding pertains to a fundamental question in post-genomic biology: Are "non-coding RNAs" really non-coding, or are they sometimes erroneously translated by ribosomes in cells into unusual proteins that should not exist? The group was the first to use direct evidence from protein mass spectrometry, preceding efforts that employed indirect evidence from ribosome profiling, to demonstrate that specific lncRNAs are recurrently and non-randomly translated in human cells (Bánfai et al 2012, Genome Research 22:1646-1657). "This year, in our NIH New Innovator Award-funded human breast cancer project, we integrated RNAseq, ribosome profiling and mass spectrometry to globally assess lncRNA translation in human estrogen receptor alpha positive MCF7 breast cancer cells. We identified multiple peptides, mapping to open reading frames of the same long non-coding RNA gene, that were united by a novel and highly unconventional property. The existence of these peptides is consistent with, and strongly suggests, stop-to-nonstop in-frame replacements of specific stop codons by amino acids," Dr. Lipovich said. The result, validated by the absence of any genomic mutations, polymorphisms or RNA editing events in genomic and cDNA targeted resequencing, represents an unprecedented apparent gene-specific violation of the genetic code in human breast cancer cells. The work would be "impossible without the five hard-working members of my lab. I am grateful in particular to my senior scientific staff: Erica L. Kleinbrink, M.Sc., and Anton-Scott Goustin, Ph.D., for their essential and continuing contributions to the computational and experimental aspects of this work, respectively. I also thank my other hard-working research assistants, Pattaraporn Thepsuwan, Juan Cai and Donghong Ju in my lab, as well as my colleague Mary Ann Kosir at Karmanos Cancer Institute," he added. The two-year fellowships, established in 1985, are named for Charles H. Gershenson, a former member of the university's Board of Governors.